I've prepared four easy barbecue salmon recipes for your grill each with distinctive flavors and all that can be cooked in a very short space of time. TIP - When doing fillets, do the skin side first and the majority of the grilling on this side, then just turn over to finish the other side. TIP - If doing a whole fish side, scrape a knife over the skin from tail to head (this is called scaling) and this makes the skin less leathery. The time to cook salmon is really difficult to predict because salmon comes in all shapes and sizes and it also depends on the intensity of heat from your grill. If I'm doing a fillet then I give it about 7 or 8 minutes on each side over medium hot coals, a large salmon will take 20 minutes on each side. A whole salmon - the eyes turn milky. 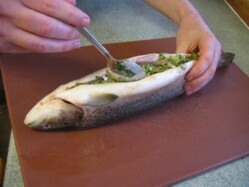 Fillets / Side - the skin will peel away easily. This first of my barbecue salmon recipes can be done with fillets or steaks and the sauce is good for about 4 pieces salmon fillets or steaks (150g / 6 oz. each) and all it calls for is the sauce to be brushed on during the cooking. 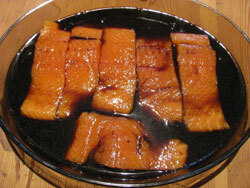 The basis of the recipe soy and sugar is a classic and it gives the salmon flesh a lovely dark glaze. There's that chilli kick from the Tabasco to finish things off too. You may need to warm the sauce through a little to dissolve the sugar but you don't need to wait for it to cool before using it because it's going to be applied over direct heat. Soy sauce is brewed from soya beans and gluten is in there too. Forgive me for stating the obvious but salmon contains fish! Mix the sauce ingredients in a pan and warm through. Place the salmon fillets on the grill and brush over the sauce. Cook the fillets for approximately 10 minutes on each side (depending on thickness) brushing more sauce over occasionally. Brush the barbecue sauce onto the steaks throughout the cooking process and when finished sprinkle on a little garlic salt and pepper and pop a wedge of lemon on the top. Now you can go down the shops and buy a great tasting Teriyaki marinade and make a perfectly respectable Teriyaki grilled salmon but come on, it's so easy, you've just got to make up the marinade yourself. All you need to add are some salmon fillets of about 150g each, there's enough marinade to cover 6 or 8 portions. 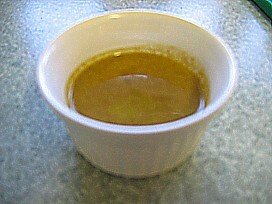 Soy sauce is brewed from soya beans and contains gluten. In addition there is sesame oil which is derived from the sesame seed. 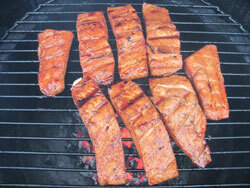 Don't forget that all my barbecue salmon recipes contain fish! Just place all the marinade ingredients into a saucepan and bring it to the boil whilst stirring to dissolve the sugar. As soon as it starts to boil you can take it off the heat and put it to one side to cool. Whilst the marinade is cooling you've got time to pin bone your salmon. Your fishmonger no doubt will have done a good job but it's always a good idea to pass your own scrutiny over the fillet. Use your eyes and fingers to detect any bones and remove them with tweezers or a set of (clean!) pliers. Once the marinade is cool you can place your salmon fillets in the marinade bowl and pour over the marinade. Cover and refrigerate for at least 30 minutes but longer if possible. Medium hot coals are the order of the day and grill the salmon for approximately 10 minutes on each side depending on thickness. 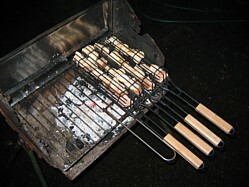 Remember that the marinade has sugar in it so you risk burning the salmon if your coals are too hot. During the cooking you can also spoon on a bit more of the marinade for that extra "je ne sais quoi". TIP - To avoid and chance of the fish breaking up, use a barbecue fish mat and only turn the fish once using a "burger flipper". 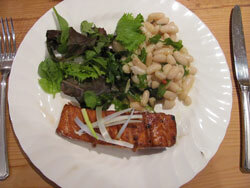 To serve, I suggest a green salad together with a cannellini bean salad. Now for the Daddy of all barbecue salmon recipes! What’s great about this recipe is that not only does it taste good but it really looks impressive so great for that barbecue party. This is the most fiddly of my barbecue salmon recipes because I've used a whole salmon that has been boned out for stuffing (ask your fishmonger to do this if possible). If doing it yourself, don’t worry, it’s a bit like making two fillets but just keep the dorsal flesh and skin intact. When finished don’t forget to scale your fish. You’ll need half an hour for preparation of the stuffing and at the same time put half a dozen cocktail sticks to soak in water. 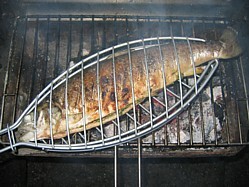 You'll also need a large barbecue fish basket. Sometimes it makes sense to add the allergens and other times I think that I might be insulting your intelligence. For the avoidance of doubt you'll find that both the salmon and anchovy contain fish and the mustard contains mustard. Chop everything really finely and throw it into a bowl, pour in the vinegar and the mustard and stir. Then gently stir in the olive oil, a pinch of salt and pepper to taste. 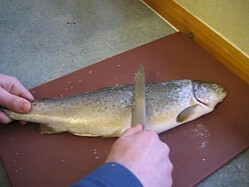 Paste the stuffing on the inside of the cavity and use the cocktail sticks to thread the belly of the salmon closed. On medium hot coals lay the salmon on a pre-oiled grill for approx 20 minutes each side and brush with a little olive oil from time to time. Resist the temptation to turn it because this is what causes barbecue fish to break up. 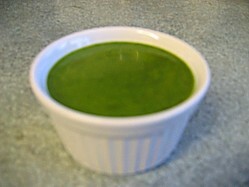 Transfer to a pre-heated serving dish and sprinkle on the dressings. 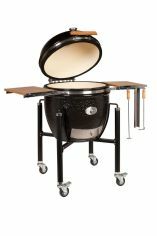 Et voilà - the taste of the Mediterranean in your backyard barbecue! What makes the last of my barbecue salmon recipes special is the Mojo sauce (pronounced moho) that accompanies it. In fact I’ve got two fish sauces, one spicy Mojo Red and the other herby Mojo Green so take your pick – or why not do both? The origins of the sauce lie in the Canary Islands and it has to be said that these sauces work well drizzled over baby new potatoes as an alternative way of seasoning a barbecue potato salad just as well as Salmon so feel free to mix and match. I especially like the green one done this way. This is an original tapas recipe and tapas in Spain is all about small quantities on a plate just to taste whilst enjoying an aperitif before lunch. To that end I've made this recipe by grilling the salmon in chunks that can then be skewered with a cocktail stick. If you wish to present this more like a main course than of course then be my guest - just keep the steak intact and cook it for slightly longer. What makes this recipe really easy to do is that fact that the sauces don't need cooking. All you need to do is take the list of ingredients and mix everything together. Just place the solid ingredients and spices into a food processor and blitz then gently drizzle in the olive oil. Transfer to a small dish and stir in the vinegar and season to taste. Surprise surprise, my barbecue salmon recipes contain fish! If you haven't got a suitable basket then try using a Teflon barbecue fish mat, just make sure you brush it with oil before cooking and the salmon will cook beautifully without sticking and disintegrating. When cooked, transfer to a serving dish and then spoon over the Mojo sauce. Tuck in and enjoy.